Nikolas Wallenda was born on the 24th January 1979 in Sarasota, Florida, USA of Austro-Hungarian ancestry. He is probably best known for being not only a stunt performer, but also a daredevil, acrobat, and high wire artist, who holds nine Guinness World Records for various acrobatic feats. He is also recognized as the first person to walk a tightrope directly over Niagara Falls. His career has been active since 1992. So, have you ever wondered how rich Nik Wallenda is? It is estimated that the total size of Nik’s net worth is over $3 million, as of mid- 2016, most of his wealth coming from his professional career as a high wire artist. Another source is coming from co-owning – with Wallendas Inc. – a premier entertainment company. Beside that, he has published a book, and has appeared in a reality TV series, which have also increased his net worth. 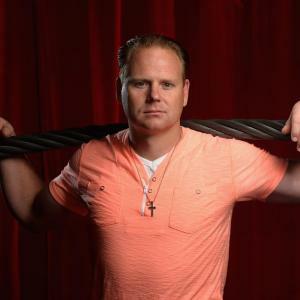 Nik Wallenda is the son of Delilah Wallenda and Terry Troffer; he represents the seventh generation of The Flying Wallendas family of aerialists. His great-grandfather, Karl Wallenda, died walking the wire between two towers in Puerto Rico in 1978. He began to perform with his family in their circus acts when he was still a child, at the age of two walking the wire. His first big performance came in 1981 at Sea World San Diego, when he was dressed like a clown. He trained a lot with his family, and spent one part of his childhood in a mobile home, as his parents were constantly traveling. Nik’s professional career began at the age of 13, when he made his debut walking the tightrope. Although he enrolled at college, his plans changed in 1998, when he took part in a seven-person pyramid on the high-wire – a re-creation of Karl Wallenda’s.. In 2001, he set his first Guinness World Record, when he walked with his family across a 30-foot-high (9.1 m) tightrope in six minutes. From that point on, his career has gone only upwards, as well as his net worth. From 2002 to 2008, Nick performed alongside his family at Wet ‘n Wild Emerald Pointe in Greensboro, North Carolina, Raging Waters in San Dimas, California, and in 2008, the sixteen members of the family featured in the Ringling Brothers production “Bellobration”, in which Nick together with his wife performed with the double Wheel of Steel. Later, in October of 2008, he performed live on “Today”, walking and then bicycling off the roof of the Prudential Center in Downtown Newark, New Jersey, across a suspended high-wire more than 13 stories (135 feet) above the ground. He completed the challenge in five minutes, setting Guinness World Records for both highest and longest bike ride on a high-wire, increasing further his net worth. The following year, Nik created the “Walk Across America Tour”, beginning with a performance at the Worlds of Fun in Kansas City, and ended at Carowinds. During 2009, he completed a total of 15 high-wire performances. The next Guinness World Record he set was in 2010 for the highest bicycle ride, when he performed at the Atlantis Paradise Island resort in the Bahamas, and another Guinness World Record came in the following year, performing the Wheel of Death 23 stories up in Atlantic City. In 2011, he completed a performance in Puerto Rico alongside his mother, Delilah, in honor of his great-grandfather’s memory who had died attempting the same feat. During the same year, he also hung by his teeth from a helicopter above Silver Dollar City, setting his sixth world record, which added a lot to his net worth. To speak further of his accomplishments, he made the Niagara Falls crossing on a tightrope in 2012, and also became the first person to walk across the Grand Canyon on a high wire. Furthermore, he set two more records, crossing back and forth on a tightrope between two skyscrapers in Chicago, once while wearing a blindfold. Additional to all of these performances, he created the reality TV series “Danger By Design”, on The Science Channel, and later it was renamed “Nik Wallenda: Beyond Niagara”. Besides that, he has also published his memoir “Balance: A Story Of Faith, Family, And Life On The Line” (2013), which also contributed to his net worth. Regarding his personal life, Nik Wallenda has been married to Erendira since 1999; the couple has three children. Place Of Birth Sarasota, Florida, U.S.
1 We take pride in being a zero-impact operation. We don't drill into any rock or pull up any grass. We'll use cranes, and we're trying to arrange the rigging so no cable will even touch water when we set up. The 'Maid of the Mist', I would hope, would continue to run. You'll never know we were there. 2 (on attempting to cross Niagara Falls on a high-wire) My idea scenario would be a foggy day. I disappear into the mist, then appear on the other side. How cool would that be? Worst case scenario: I sit down on the wire , the helicopter swoops in, I hook on and they get me out of there. I look goofy but nobody gets hurt. 3 Rule of thumb to even be on the wire: you have to be able to do ten chin-ups and pull your body over the wire ten times. 4 I tell mom to 'watch it' in every show. When I look like I'm off-balance? Moving my bar like crazy? All to build drama. People understand that we're entertainers. That's where our skills come in, and believe it or not, it's the hard part of what we do. 1 He became the first person to walk on a high wire over the Grand Canyon during the live broadcast of Skywire Live with Nik Wallenda (2013). 2 Parents are Delilah Wallenda and Terry Troffer. 3 Father of Yanni Wallenda, Amadaos Wallenda, and Evita Wallenda. 4 Grandson of Karl Wallenda. 5 Nik Wallenda became the first person to walk across Niagara Falls on a tightrope. He crossed some 200 feet in the air on a two-inch-wide tightrope over the raging waters of Horseshoe Falls, the largest of the three falls that make up Niagara Falls. He walked from the U.S. and stepped into Canada, barely 25 minutes after he started.